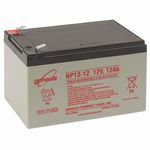 Fuller NP12-12 VRLA Battery utilises the latest advance design Oxygen Recombination Technology to produce the optimum design of Sealed Lead Acid batteries. Superb recovery from deep discharge. Multipurpose: Float or Cyclic use. Usable in any orientation (except continuous inverted). Lead calcium grids for extended life.